Formula 1 pre-season testing: What have we learned about the teams? "Testing, done," Lewis Hamilton said on Friday. "Let's get to racing." Probably everyone involved with Formula 1 can identify with that sentiment. Eight days of running over two weeks at Spain's Circuit de Barcelona-Catalunya threw almost everything at the teams. There was snow, freezing temperatures and heavy rain in a truncated first week. And incredible amounts of mileage for most in the sunny second. In total, the teams covered 37,138km - or very nearly the circumference of the earth. Mercedes' car ran so reliably that they split their days between drivers Hamilton and Valtteri Bottas so as not to tire them out. Mercedes covered 1,040 laps, 4,841km - or, to put it another way, about three-quarters of a grand prix season's racing mileage. Despite the restricted running in week one. They, Ferrari and Renault all regularly exceeded 150 laps a day - two and a half grand prix distances. Even the notoriously unreliable Honda engine ran almost trouble-free with the Japanese company's new partner, Toro Rosso. That was a positive surprise - as was the pace of the Haas car, which raised eyebrows up and down the pit lane. On the negative side, it was a difficult fortnight for McLaren and its star driver Fernando Alonso, even if they remained resolutely positive about their prospects in the face of seemingly never-ending reliability problems. How to understand the lessons of testing? That is a tricky question at the best of times, and even more so this year. A new track surface at Barcelona, which was smoother, less abrasive and up to two seconds faster than before, coupled with new tyres from Pirelli and a dizzying number of compound choices, meant interpreting the lap times was even harder than normal. One thing that can be said for certain is that the list of absolute fastest times by each team is not an accurate reflection of the competitive order. For a start, they were not all set on the same tyre. And pre-season favourites Mercedes set only the seventh fastest time. Normally, at this point one might start talking about the offsets between tyre compounds, calculating lap times based on fuel-load estimations and length of run, and make an attempt to disperse some of the fog. But two weeks of trying to do that left this writer feeling like his head was going to explode. Playing around with tyre offsets and fuel loads gave one list - which Mercedes headed, followed by Ferrari, Haas, McLaren and Red Bull. Looking at the pace of the cars when they were doing race-simulation runs gave another - which Mercedes also headed, followed by Ferrari, Red Bull, Haas and Force India. Looking at the best times set on each tyre compound was also confusing. For a start, Mercedes did not run the fastest 'hyper-soft' tyre, and their best times on the ultra-soft and super-soft were slower than Ferrari's. There was not even a consistent sense of what difference in lap time each of the tyres made - perhaps because that seemed to be different for different teams. The race simulations, where Mercedes were very strong, were potentially misleading because they did all their running on the medium tyre, the best for a long run, whereas most other teams mixed compounds up, as they would be forced to at a grand prix, which compromises performance. On top of that, the conditions - cooler than would be expected at a grand prix - might have flattered Mercedes. And there were some anomalies about Ferrari's times that led some to suspect they might have a fuel-consumption concern. The problem with playing with all this is that an outsider can never have as much data as the teams themselves and there are so many variables. And even the teams can't be sure. As McLaren racing director Eric Boullier put it: "It's difficult to understand because of the tyre situation, the temperatures, engine mode, fuel load - it's more complex this year than ever. "It looks to me like there are some teams who progressed well, like Haas and Renault. I think the fight at the front will still be between Mercedes, Ferrari and Red Bull. The pack got closer, and we believe we belong in the middle of this." Boullier's view of the front of the field was echoed by other teams. There was a consensus that Mercedes were favourites and probably ahead, but that Ferrari and Red Bull were not far behind. The order, though, remains unclear. Red Bull driver Daniel Ricciardo said: "I think we're looking OK. I don't think we're fastest but I think we will be close enough to be in the hunt. We're there or thereabouts. "Mercedes are still quick. If everything was equal right now, they still have a little bit on the rest, but I don't think we're far behind. I think it's positive." Are McLaren as bad as they often looked? It was a chastening couple of weeks for McLaren, whose poor reliability had almost become a running joke by the end of testing. A wheel fell off. The exhaust melted the rear end. There were leaks. And hydraulic failures. A turbo went. The car looks lovely in its orange and blue livery but until the last day it was slow - around seventh fastest out of 10 teams. But then on the final day, Alonso pumped out a quick one, to be second fastest and just 0.5 seconds slower than Kimi Raikkonen's Ferrari. 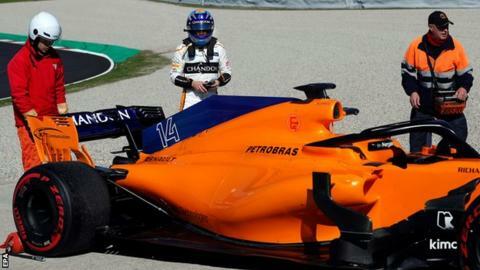 Which is much more like what McLaren were hoping for when they switched from Honda engines to Renault over the winter. Boullier admitted that the team had let themselves down with their reliability. "So far we had minor issues, but I think that's because we did not do a good enough job to prepare the car," he said. "We were a little bit stretched in terms of lead-time and delay. This is our issue. I think very quickly we are going to get back to normal." This is understandable in the circumstances. The engine switch was confirmed late in the day - about two weeks after the ideal last possible moment for it. That put McLaren behind and they have not caught up yet. But Alonso, who by this stage last year was at his wits' end with Honda, was staying positive in public. "In the final day we put a little bit more performance on the car and everything seemed to work in the right direction," he said. "Still more to come. I think everyone is hiding a bit, as we are too." Reading between the lines of Boullier's comments, it seems McLaren had to make some compromises with the car they ran in testing, just to get it there. The word is that they have a big upgrade to come for the first race - bigger than would be normal. Boullier admitted that reliability was not where he would like it to be and that there was "a higher risk of failure" because of the lack of mileage. And he asked people to give it "a few races" before judging where they were, given the circumstances. Until Alonso's final time, the feeling was that McLaren were towards the back of the midfield group. Now they may well be towards the front - with Renault and Haas. Either way, this is a critical season for McLaren. With the same engine, Red Bull are their benchmark. Last season they said they thought their chassis was in the same ballpark. But that is a high standard indeed to meet. Just as Alonso recalibrated expectations of McLaren on the final afternoon, so Kevin Magnussen did the same for Haas the previous day. Magnussen's time was especially impressive - 1.2secs slower than Sebastian Vettel's Ferrari, despite using super-soft tyres, which were said to be a second or so slower than the hyper-softs the German used. And the Dane's team-mate Romain Grosjean came close to matching Magnussen's time on the final day. It would be a gargantuan surprise if Haas were that quick when it matters, but their laps were described by another team as "genuine fourth-fastest overall times". Team boss Gunther Steiner said it was simply down to getting the tyres to work. If that pace continues, though, it might bring some political trouble. Haas have an agreement to buy as much of their car as is allowed from Ferrari - everything bar the monocoque and aerodynamic surfaces. But some rivals are suspicious of the arrangement and wonder whether the lines get blurred. This was an issue in their debut season, but went away last year. There are whispers it could raise its head again if Haas continue this form. Pierre Gasly's time in the Toro Rosso was also very impressive - as was the team's entire winter. The Honda ran trouble-free until the final day, when an "anomaly in the data" - a term familiar to anyone who closely followed McLaren's three years with Honda - caused them to stop running. Logic, though, dictates that Toro Rosso will be somewhere in the midfield, but outside the top 10. The Honda - like the Renault - is said to be giving more or less the same performance as at the end of last year, so remains the worst engine. And Toro Rosso are a small team with limited resources, and therefore potential. Of the rest, Force India are a bit of a mystery, looking slower than one would expect of a team that has finished fourth for the past two seasons. Williams might be facing a difficult start to the season. And unsurprisingly Sauber seem to be at the back, albeit not as far adrift as last year. When testing started, the new 'halo' head-protection device was on everyone's lips. But it is amazing what a difference two weeks makes. By the end of the test, hardly anyone was talking about it any more, and the drivers who were not in favour of it - a large minority - have simply accepted it and moved on. It makes getting in and out of the cars harder. It is more difficult to identify the drivers in the cars. But it is unlikely to make any difference to the racing. And, many of the teams having tried to blend it into their colour schemes, it's remarkable how quickly one stops noticing it in photographs of the cars. The on-board camera view from above the driver's head could probably do with being looked at, but the suspicion is that by mid-season it simply will not be a thing any more.